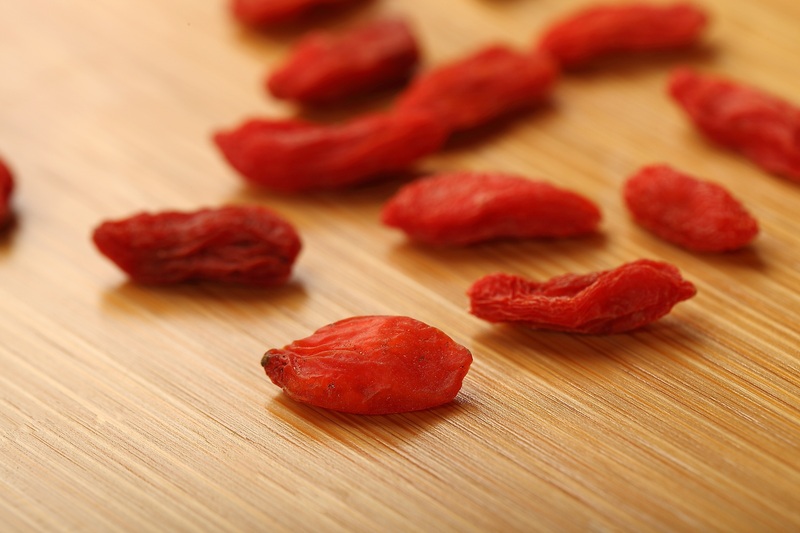 Gou Qi Zi (Wolfberry fruit; Lycium fruit) , the dried fruit is ovate, spindle-shaped. The skin is bright or dark red. Large, red fruits with few seeds and sweet flesh are best. The botanical name is Lycium chinense Mill. ; Lycium barbarum L; and the pharma name is known as Fructus Lycii. The taste is sweet with neutral properties. It enters the liver and kidney channels. 1. Impotence, nocturnal emission, aching back and legs 2.Vertigo, decreased eye-sight 3. Diabetes mellitus. Contra-indication: For a person with true heat; diarrhea; and spleen dampness. Carotene, vitamin B1, B2, and C, nicotinic acid, ß-sitosterol, linoleic acid, Ca, P, Fe. Recommended Dosage: 6 – 15gm. Lower the concentration of blood sugar in diabetes. Inhibit the deposition of fat in liver cells and promote the regeneration of liver cells. Lower blood cholesterol and prevent the formation of atherosclerosis. Can enhance the nonspecific immunity, phagocytosis of the macrophage, and the production of T-lymphocytes. Nourishing yin and moistening the lung, tonifying the liver and kidney, nourishing the blood and improving acuity of sight. It is used for : (1) Hectic fever due to yin deficiency; (2) Dizziness, blurred vision, decline of sight, soreness and lassitude of the loins and knees, spermatorrhoea and diabetes, etc. Actions and indications : Tonifying the kidney, promoting the production of body fluid, nourishing the liver and improving sight. It is used for deficiency of the liver and kidney, soreness and lassitude of the loins and knees, dizziness and blurred vision. Direction and dosage : Take 9-15 grams orally, twice a day. Ingredients : Wolfberry fruit, Chinese angelica root, fleece-flower root, capejasmine, cynomorium, safflower, psoralea fruit, poria ophiopogon root and achyranthes root, etc. Actions and indications : Tonifying the liver and kidney, nourishing blood and improving eye sight. It is used for deficiency of both the liver and kidney, dizziness, blurred vision, and soreness and pain of the loins and knees. Direction and dosage : Take 10-15ml orally, twice a day. Caution : It is contraindicated for patients with hypertension. Ingredients : Wolfberry fruit, chrysanthemum flower, prepared rehmannia root, poria, Chinese yam, alisma, schisandra fruit and glossy privet fruit, etc. Actions and indications : Nourishing yin and improving eye sight. It is used for yin deficiency of the liver and kidney, dark vision, dizziness and tinnitus. Direction and dosage : Take 9 grams orally, twice a day. Ingredients : Wolfberry fruit, chrysanthemum flower, prepared rehmannia root, dogwood fruit, moutan bark, Chinese yam, poria and alisma. Actions and indications : Nourishing the kidney and tonifying the liver. It is used for yin deficiency of the liver and kidney, dizziness, tinnitus and blurred vision. Direction and dosage : Take 6-9 grams orally, twice a day. The fruit contains betaine, zeaxanthine, physalien, carotene, ß-sitosterol, thiamine, riboflavine, niacin, ascorbic acid, linoleic acid, vitamins B1,B2, C, various amino acids, and elements such as Ca, P and Fe, etc. Liver-kidney yin depletion; weak, weakening and aching of knees and lumbago; dizziness; copious tears; vacuity taxation cough; wasting thirst; seminal emission. Daily dosage: 5 – 10g. Used for multiple myeloma, carcinoma of pancreas and liver cancer.